Finally, after almost a year in production and around 300 hours devoted, it is here at last! 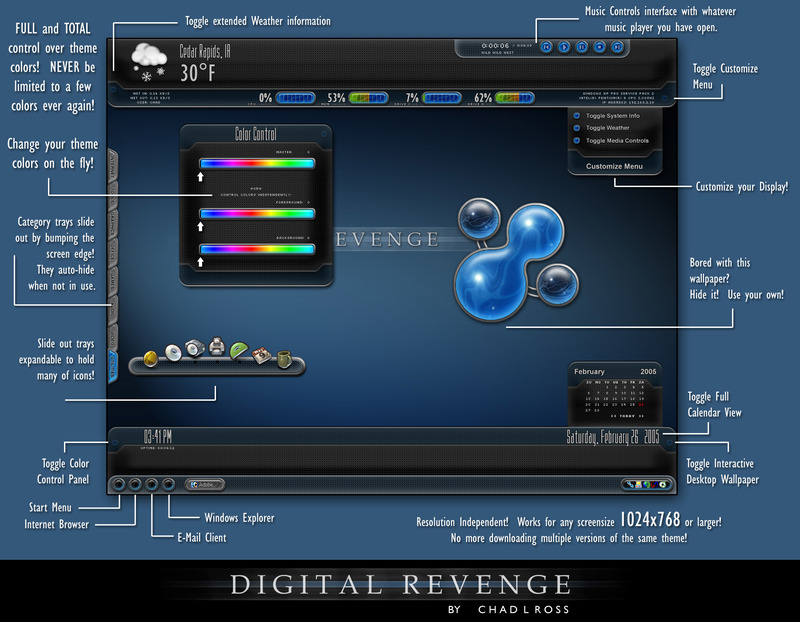 Welcome to the Digital Revenge DesktopX theme! Designed for use with DX 2.40f and fully tested and compatible with DesktopX3! Designed for looks AND added functionality! Includes many many features! Basic and extended weather information, loads of system information, calendar, clock, 8 expandable launching trays with animated icons and much much more! Best of all: This theme is RESOLUTION independent. This will work on 1024x768 or larger. Tested all the way up to 2048x1532! Works on widescreen desktops and laptops! Oh wait, THIS is the BEST feature: TOTAL Color independent as well! Bored with blue? Change it! Do you love purple? Change it! Do love a mix? Select two colors! View the screenshot and for a description of what the buttons do. All buttons have mouse-over text as well. In addition, this theme provides quite a number of options so it is difficult to describe in just one screenshot. See below for additional screenshots of the theme in action! 1) Download the .dxtheme file. 2) Set your screen resolution to 1024x768. 3) Launch DesktopX if not already started and load the theme. 4) Change your screen resolution back to the desired size. Note: A restart of the computer and/or DesktopX may be needed. * I'm sorry these steps are needed, but at this time it's the only way I can develop a truely resolution independent theme. A) Symptom: When an instant message arrives via Trillian, processor usage will spike for several seconds. Solution: Turn off the "flash taskbar" option for incoming messages. Thanks to Martin for allowing me to include his calendar and weather scripts. Thanks to all of my testers over the last year! Your feedback has helped greatly! 1) http://www.deviantart.com/deviation/15560655/ Showing off my favorite alternate colors! 2) http://www.deviantart.com/deviation/15560696/ Showing off how you can even select some nasty colors... It's all about personal taste! 3) http://www.deviantart.com/deviation/15560864/ Tired of the built in theme wallpaper? Hide it! Use your own! Showing here is "Last Day". This screenshot also shows off the extended weather information, and slide out launching trays. 4) http://www.deviantart.com/deviation/15561070/ Worried about the theme taking up too much real estate? Full screen app showing here. Only the taskbar reserves screenspace. 5) http://www.deviantart.com/deviation/15561284/ What Windowblinds looks good with it? I'm using Stealth OS by Mike Bryant. I have also created several visual tutorials to aid in customizing your theme! 1) http://www.deviantart.com/deviation/15585140/ "How to add icons to your launch trays"
2) http://www.deviantart.com/deviation/15586075/ "How to expand your launch trays to hold more icons"
Awesome work done here, and they only gave me 5 stars to rate it. Look and work great and, no "glitches" as far as I can see on my system. The resolution indepenency works great too. Excellent theme. Very well presented. AWESOME-thanks for sharing this wonderful theme with all of us Chadamus. Fantastic.. All the work you put into it really shows. Thanks all! I'm glad it's useful! Best theme ever!? I like the sound of that. This is without a doubt THE best theme I've seen. O.K.,so what are you going to do to top this?? A digital Masterpiece!!! Thanks for sharing! By the way, you truly are a "Man On Fire"! Excellent work on your part. Themes like this are what DX was made for. I'm not very competent with Desktop X. Could someone tell me how to get the tabs on the left side to stay visible? Aye. Known your work for a few years..this is a clumination. Was waiting for something really significant to get back into DT X. This is it Had no probs with your reso instructions.going to 1600X 12oo was a snap. No probs. GT3 wb by Tiggs also works well with it, as does his GT3 wall paper as the alternate to the theme paper. A bottm Object dock with the right background (I'm using alienware onix pod with some transparency) fits between the trays nicley at the bottom. Love the extended weather. Haven't got the launcher trays up yet.. how do?